Android instant apps are a powerful new way of getting your app in front of as many users as possible. Once you’ve added instant app support to your project, users don’t even need to have your app installed in order to access its contents and features—they’ll be able to load entire sections of your application on-demand, simply by tapping a URL. In this three-part series, I’m covering the entire process of adding instant app support to your Android projects, so by the time you’ve finished you’ll know exactly how to create Android applications that are discoverable and accessible for any location that supports URLs. In the first post, we looked at what instant apps are and how they work, as well as examining why this new feature is such big news for both Android developers and Android users. Previously, we took a few shortcuts and created an Android project that has instant app support built-in, but we didn’t look at how to add instant app support to an existing project—so this is what we’re going to be focusing on in this post. I’ll also be showing you how to implement App Links, so by the end of this article you’ll have created a fully functioning instant app that you can launch and test on any compatible Android device. Adding instant app support to a project typically requires you to make some pretty drastic changes to how that project is structured. Chances are you’re not too keen on the idea of experimenting with a new feature by completely changing the structure of one of your own Android projects, so I’ve provided a sample app that you can download from GitHub. Throughout this article, we’ll be working on updating this specific project to support the instant apps feature. 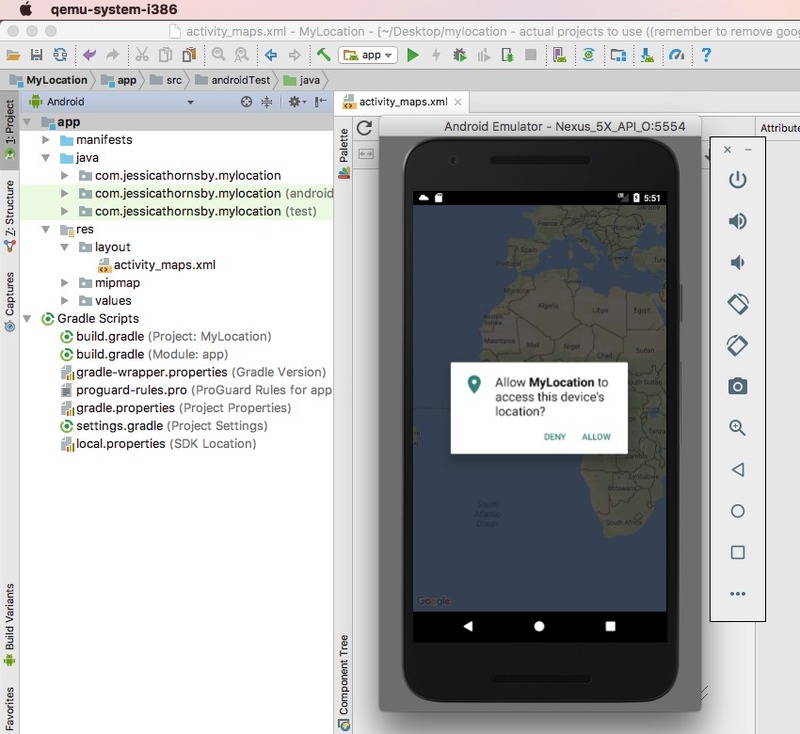 Download the MyLocation project from GitHub and open it in Android Studio. You’ll see that this is a pretty straightforward project, made up of a single app module that contains one Activity (MapsActivity). Open the project’s res/values/google_maps_api.xml file. 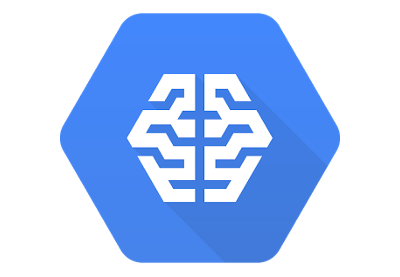 Generate your Google Maps API key, by following the instructions in this file. Create a base feature module containing all the code and resources that are required to deliver this single feature. Create an instant app module that’ll serve as the container for our instant app APK. Use App Links to map a specific URL to this base feature module. We won’t be adding any additional feature modules to this project until the next post. However, as you’ll see when we come to test MyLocation, it’s perfectly possible to add instant app support to a project by creating a base feature module and an instant app module—additional feature modules are an optional extra. Since the MyLocation project consists of a single feature only, we pretty much need to include all of its code and resources in the base feature module. We can make this task much easier by turning this project’s app module into the base feature module, and then creating a new module to serve as a replacement app module. This is a handy shortcut that you may be able to use when adding instant app functionality to your own real-life Android projects. However, if this shortcut isn’t feasible for a particular project, then you’ll need to create a new module to act as your base feature module, and then spend some time moving all the relevant code and resources into this new base feature module. Our first task is converting MyLocation’s app module into a base feature module. In the Rename module window, enter mylocation-base and then click OK.
Open your newly-renamed mylocation-base module’s build.gradle file. The first line reveals that this module is still using the default com.android.application plugin; however, all feature modules must use the com.android.feature plugin, so you’ll need to change this to apply plugin: 'com.android.feature.'. Make it clear that this module is your project’s one and only base feature module, by adding the baseFeature true attribute to the android block of code. Any project that supports the instant app feature is inevitably going to consist of multiple modules, but you only need to declare the project’s applicationID once—and that’s in the app module. To avoid conflicts and confusion, you should remove this attribute from the rest of your project, so find the applicationID attribute in the mylocation-base build.gradle file, and delete it. Select New > New module… from the Android Studio toolbar. In the window that appears, select Phone and Tablet, and then click Next. Let’s stick to the naming convention we’ve established, and call this module mylocation-app. Click Next. This module should contain the code and resources that you want to include in your installable application, but to help keep things as straightforward as possible, click Add No Activity, and then click Finish. Open your mylocation-app module’s Manifest file. If you think back to the project we created in the previous post, you’ll remember that the app module’s Manifest was pretty much empty, because eventually the contents of all the other Manifests scattered throughout this project would be merged with this file. This is exactly what’s going to happen with our MyLocation project, so to avoid any conflicts during the merging process, you should delete this Manifest’s entire application block. Remove all unused files and directories from your application module, by switching to Android Studio’s Project view and deleting the src/androidTest directory. Then, open the main directory and delete the Java, res and test directories. Launch the AVD (Android Virtual Device) we created in part one, or connect a physical Android device that’s compatible with the instant app feature—at the time of writing, this is limited to the Nexus 5X, Nexus 6P, Pixel, Pixel XL, or a Galaxy S7 that’s running Android 6.0 or higher. The MyLocation app will appear onscreen and, assuming that you generated a Google Maps API key for this project, it should be displaying some Google Maps content. In the subsequent window, select Instant App and then click Next. Give this module the name mylocation-instantapp and click Finish. The user launches an instant app by tapping a URL that’s mapped to a base feature or feature module. This URL could be anywhere—maybe it’s a URL a friend has sent them directly via email or instant message; maybe it’s a URL they’ve spotted in a tweet, forum or in a comment thread, or a URL that’s popped up in their Google search results. Regardless of where it appears, when the user taps this link, Google Play will recognise that it’s associated with a base feature or feature module, and retrieves all the code and resources required to run this particular module on the user’s device. In this section, we’re going to establish this relationship between our base feature module and a URL, using App Links. 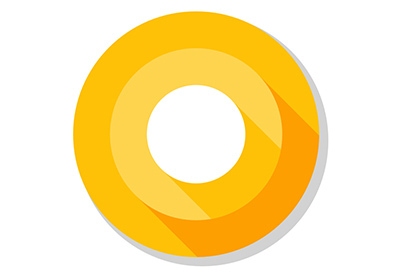 The Android App Links feature was originally introduced to help users bypass Android’s app selection dialog when they were trying to access content that could be handled by an app that’s already installed on their device. For example, if you tap a link to a YouTube video, then the system may display a dialog asking whether you want to open this link in the YouTube app. In the context of instant apps, App Links allow you to map a feature module’s entry-point Activity to a specific URL. We explored entry-point Activities in part one, but as a recap, they’re the first Activity the user sees when they launch your base feature or “regular” feature module. When you’re adding instant app support to a real-life project, you’ll need to decide which Activity would make the most effective introduction to your instant app component, but since mylocation-base only has a single Activity, this decision has already been made for us! Uploading a Digital Asset Links file to the domain you’re working with (in this instance, www.example.com) is a crucial step in the App Links process, as it’s how the system verifies that your app has permission to act as the default handler for all the links associated with this domain. Although I’ll be covering the process of generating and uploading a Digital Asset Links file, since we don’t own the www.example.com domain, we won’t actually be able to perform this step. However, strangely, at the time of writing it does seem possible to test an instant app component on an AVD, even if you haven’t uploaded a Digital Asset Link to the associated domain—you just need to make some tweaks to Android Studio’s runtime configuration. If you do have easy access to a domain where you can host a Digital Asset Links file, then I’d recommend replacing the www.example.com URLs with genuine URLs and uploading the resulting Digital Asset Links file to your website. However, even if you do use the www.example.com URLs then you should still be able to test MyLocation’s instant app component, by tweaking the runtime configuration. Select Tools > App Links Assistant from the Android Studio toolbar. The Assistant will open as a new panel along the right side of the Android Studio window. Give the Open URL Mapping Editor button a click. In the URL-to-Activity mappings panel that appears, click the little + icon. In the Host field, enter the domain you want to associate with this project; I’m going to use www.example.com. Path. You should select this option if you want to map a single URL to your entry-point Activity. Since I only want MapsActivity to respond to the www.example.com/maps URL, I’m going to select Path from this dropdown menu. We’ve already associated the domain www.example.com with our project, so we just need to type the final part of the URL (/maps) into the accompanying text field. pathPrefix. This option lets you be a bit more flexible with the URLs that trigger your entry-point Activity. For example, if you selected pathPrefix and then entered www.example.com/maps in the accompanying text box, then MapsActivity would respond to URLs such as www.example.com/maps/mylocation and www.example.com/maps/nearby. pathPattern. Similar to Path, this option lets you specify the exact URL that should launch your entry-point Activity. However, it also gives you a bit more flexibility, by allowing you to use wildcard characters in the accompanying text field. Open the Activity dropdown menu. Back in the App Links Assistant, give the Select Activity button a click. 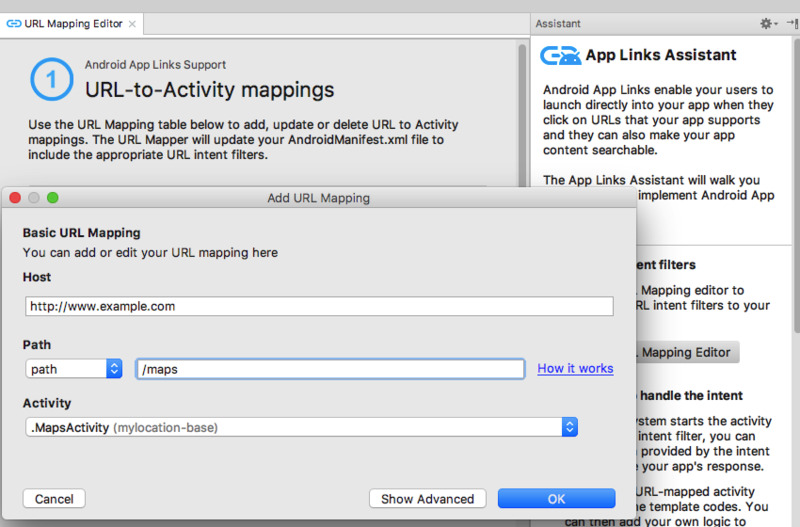 Select the Activity you want to map to your URL, which in this instance is MapsActivity. 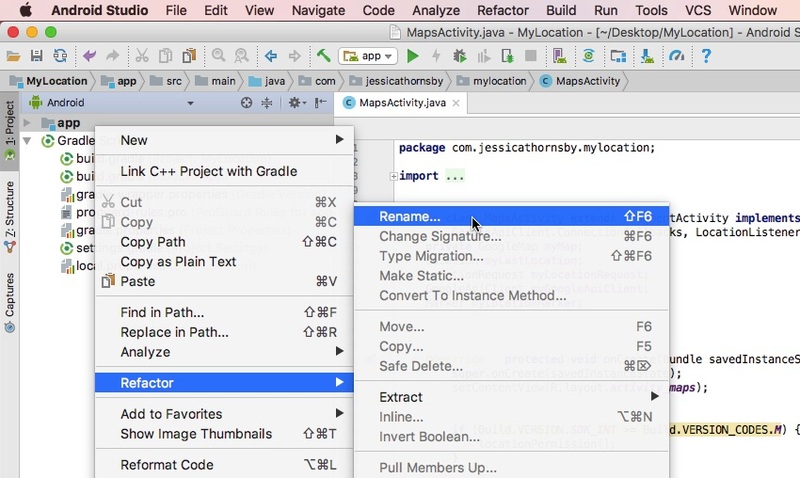 When you come to add instant app support to your own real-life projects, you’ll typically want to expand on this code, depending on how you want your Activity to react when it’s launched as an instant app, but for the purposes of our MyLocation project, these few lines get the job done. In this section I’m going to show you how to generate a Digital Asset Links file, and how to upload this file to your website. If you’re using www.example.com as a stand-in for genuine URLs, then you won’t be able to complete this step, but it’s still important to understand how to generate and upload this file, ready for when you’re adding instant app support to your own Android projects. In the App Links Assistant, click the Open the Digital Asset Links File Generator button. Enter the domain you want to associate with this app, such as www.example.com. Enter your app’s signing config, or select a keystore file. While it’s possible to use a debug config or keystore during testing, the generated Digital Asset Links file won’t be compatible with the release version of your app. If you do upload a Digital Asset Links file that uses a debug config or keystore, then before publishing your app you’ll need to generate and upload a new Digital Asset Links that uses your app’s release key. Click the Generate Digital Asset Links file button. Download the Digital Asset File, by clicking the Save file button. In the Canary builds of Android Studio 3.0, this button is sometimes positioned offscreen, so you may need to resize your Android Studio window in order to bring the Save file button out of hiding. Clicking this button will download an assetlinks.json file to your computer. You must host the assetlinks.json file at the following address https://<yoursite>/.well-known/assetlinks.json, so upload your newly downloaded assetlinks.json file to this exact location. Also be aware that Android verifies the assetlinks.json file via an encrypted HTTPs protocol, so you’ll need to ensure this file is accessible over an HTTPS connection. Back in Android Studio, click the App Link Assistant’s Link and verify button. If you’re following along with this tutorial using the www.example.com stand-in links, then Android Studio should report that you’ve successfully completed every step, except uploading the Digital Asset Links file. Now you’re finally ready to test MyLocation’s instant app component! Launch your instant app-compatible AVD. Verify that the MyLocation app isn’t installed on your AVD by opening its launcher. If you do spot the MyLocation app, then uninstall it by dragging it to the device’s Uninstall icon. Next, you’ll need to make some tweaks to our project’s run configuration, especially if you’re using www.example.com/maps to trigger your mylocation-base module. 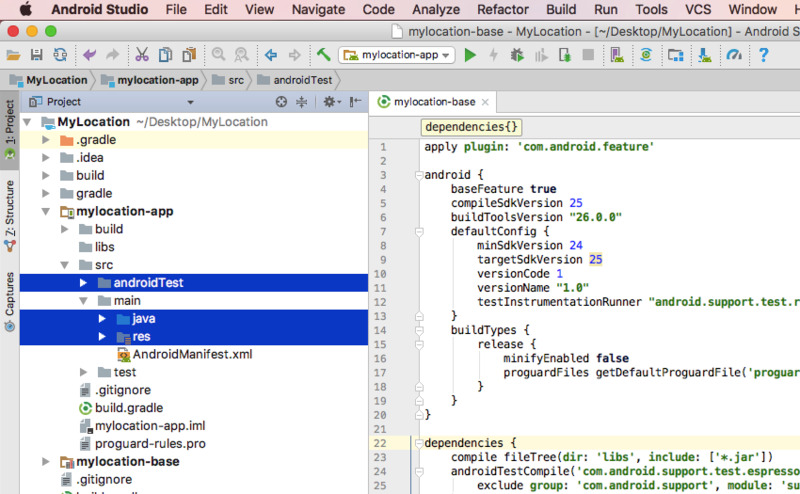 Start by selecting Run > Edit configurations… from the Android Studio toolbar. Select mylocation-instantapp from the left-hand menu. Open the Launch dropdown and set it to URL. Delete the <> text, and replace it with the URL you want to use, such as http://www.example.com/maps. When you select this run configuration, it’ll simulate the user tapping the www.example.com/maps link. Click Apply, followed by OK. Choose mylocation-instantapp as the component you want to launch. Select your target AVD, and click OK. If this is the first time you’re running an instant app on this particular AVD, then the device will prompt you to opt into the instant app program. Read the disclaimer, and if you’re happy to proceed, then click Yes, I’m in. Android Studio will now simulate you tapping the www.example.com/maps link, and the AVD should respond by loading your base feature module. At this point, the MapsActivity will appear onscreen, and you’ll be able to interact with it exactly as though MyLocation was installed on this device. To verify that MyLocation really isn’t present on this device, minimise the MapsActivity and open the AVD’s launcher—the MyLocation app should be completely absent, and yet if you click the AVD’s Recents softkey, the MapsActivity is still visible and available on this device. You can download the MyLocation project, updated with full instant app support, from GitHub. Instant apps is still very much a new feature, so it’s not all that unusual to encounter error messages, bugs and other strange behaviour, especially if you’re using one of the Preview or Canary builds of Android Studio 3.0. 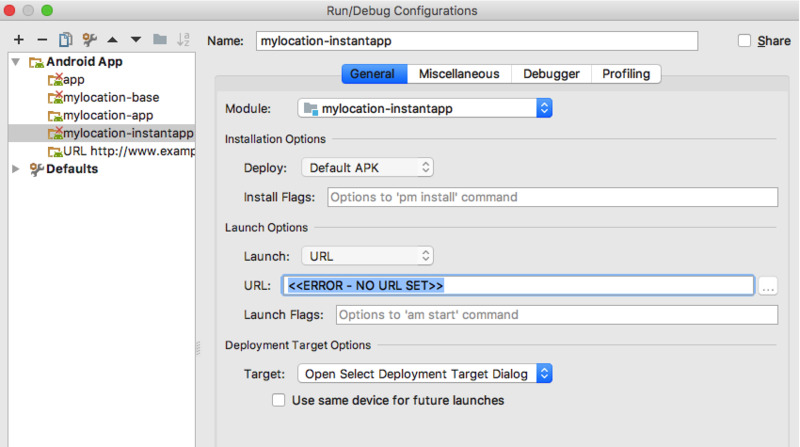 The most common problem you’ll encounter is, when selecting Run > Run instantapp from the Android Studio toolbar, to have the AVD respond by displaying the app picker dialog or by opening the URL in its default browser. If this occurs, then it means the AVD isn’t properly recognising that your URL is mapped to an instant app module, and is handling it just like a regular URL. Is Your AVD Set Up to Allow Instant Apps? Open the AVD’s Settings app. Scroll to the Services section. If you spot an Instant app option, then give it a tap. On the subsequent screen, drag the slider into the On position. Repeat the process of trying to launch your instant app module on your AVD, to see whether this has fixed your problem. Are Instant Apps Supported in Your Locale? Open the Terminal (if you’re a Mac user) or Command Prompt, if you’re on Windows. Your AVD will now reboot, and once it’s restarted it’ll be using the new locale settings. You should now be able to successfully run instant apps on this device. Open a Terminal or Command Prompt window. Use the cd command so that the Terminal/Command Prompt is pointing at the adb program. Side loading instant app failed: Reading bundle timed out. Select Instant app provision (towards the bottom of this window). Select Clear provisioned devices cache. Click OK, followed by Apply, and then hit OK once more. Attempt to relaunch your instant app component on your AVD—the problem should now be resolved. In this article, we looked at how to update an existing Android project to support instant apps, by creating a base feature module and an instant app module, implementing App Links, and then testing this project on an AVD. At this point, you have all the information you need to add instant app functionality to your existing Android projects, but with one restriction: we’ve only created a single base feature module. This means that, currently, you’re limited to offering one instant app feature per project. In the final post of this series, we’re going to rectify this by looking at how you’d add an extra feature module to the MyLocation project. That’ll be out soon. 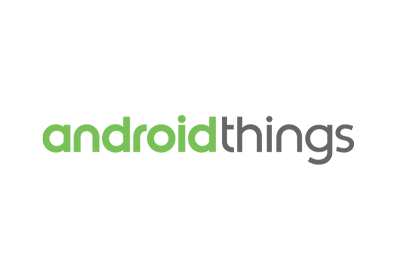 While you’re waiting, check out some of our other great posts on Android app development!